This is the book where I tried to explain the Internet to Man. Sort of. It’s almost impossible to write a tech book that doesn’t go out of date, so I didn’t write a tech book. 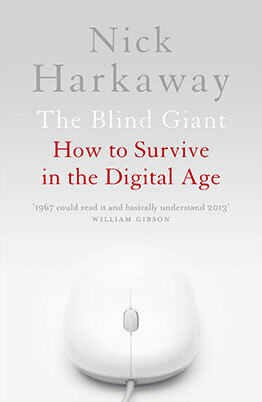 I wrote a book about humans and their relationship with technology and themselves. I tried to understand how stuff happens, how we make stuff, and what that stuff does to us. So this is a launchpad, not a book of answers. The idea is that it gives you the tools to think about this yourself. Because that’s the number one necessary skill of our times: knowing what’s happening and seeing where it’s going, and what that means for you. That’s how you handle problems before they land on your doormat at home or at work. This isn’t exactly a polemic. I don’t hold a brief for technology as a panacea, though I find those people who bemoan it tedious. Seriously, you won’t want the Internet? So you don’t want the tech revolution, the human genome project, etc? Do you really ever sit down and think about what the 70s and the 80s were really like? Look, I’ve gone off on a tangent, but it’s what you might call a relevant one. That’s what this book is about: knowing where to start thinking about all this. It’s a toolkit for your brain.